The B-17 will be the feature aircraft for February’s Aircraft of the Month. See more information on Aircraft of the Month Here. 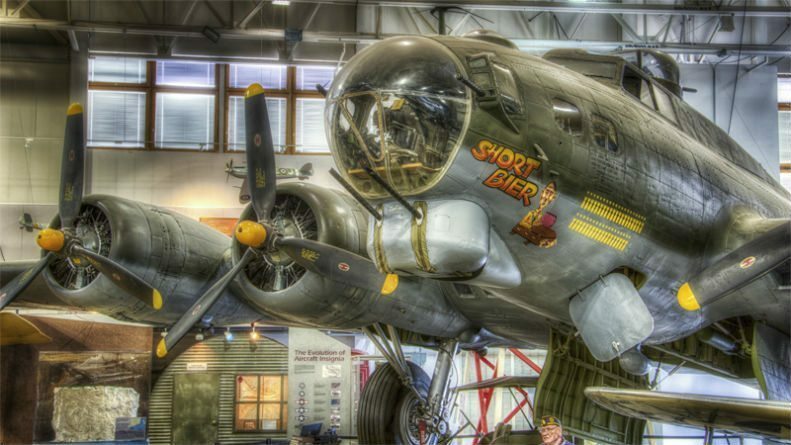 Hill Aerospace Museum is proud to display a B-17G. 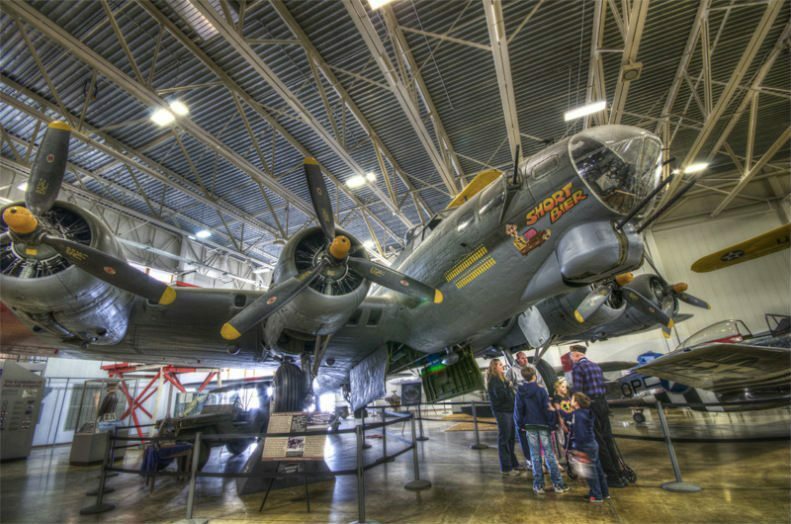 In 1987, the B-17 aircraft in the Hill Aerospace Museum was obtained by Ogden businessman John. A Lindquist, who also serves on the Board of Directors for the Aerospace Heritage Foundation of Utah, for restoration and display at the Hill Aerospace Museum. The exterior was restored in 1991 to replicate the “Short Bier” that was part of the 493rd Bombardment Group (Heavy). Originally the Short Bier was a B-24 Liberator, but when the squadron switched to B-17s, the name was transferred to a Flying Fortress. Lindquist and his crew finished their tour of duty in the B-17 “Short Bier,” but that aircraft was later lost in action. 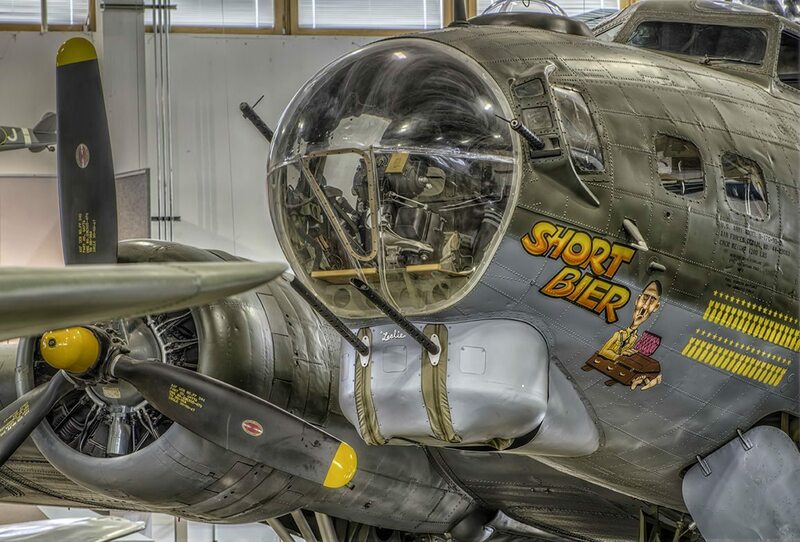 Our B-17 is therefore the third “Short Bier” and is painted in the colors of the 493rd Bomb Group. The B-17s were first introduced in 1935 and was the first Boeing military aircraft with a flight deck instead of an open cockpit. This aircraft was armed with bombs and five .30-caliber machine guns mounted in clear “Blisters.” the B-17E model was the first mass produced model of the “Flying Fortress.” These incredible aircraft could carry a 4,000 pound bomb load, as well as being equipped with nine machine guns. Each version Boeing designed was more heavily armed. The B-17 was retired in 1968 after Boeing produced 12,731 aircraft.